Goodbye Kitty - Blog - Busy, busy! So now with the reduced workload, Kitty is really fun again. Five strips is pretty painless to do all on one sitting in the weekend, and then I'm all done drawing for the week. I belong to the Mondo group, which is a loose confederation of some likeminded webcomics creators, most of whom got their start here on Comicfury. Mondo recently released a convention anthology (available for download here) which features some of the best of GBK alongside some other great comics talents. haha, oh yeah ... forgot about that. How's your memory, Al? I was thinking (and sorry for stealing any thunder you were about to bring, Rob) that the second page could introduce a D-list superheroine who's a little burned out. She goes by the nom de guerre Mnemonique, and her debatable "superpower" is that she has absolutely perfect memory. She can remember everything she ever senses, essentially a human recorder. It's not an overly impressive power, but it has brought her to the attention of a more prominent detective-type hero named Hunterman, who has pretty much made her his crime scene recorder. He then interrogates her for hours until he gleans enough crime scene information to determine the perps, then makes the busts and takes the credit. When we see her in the diner, she's drinking way too much coffee, chain smoking (despite the fact that it's a no-smoking diner), and agonizing over both her lot in life and the horrific things she's been forced to witness by Hunterman. And that will leave the door wide open for page three. Then I decided to script the page, and post the script on the jam topic page, so that if anyone had gotten excited by this they could jump in at the end of my page without waiting for me to actually finish it. Closeup of a coffee cup and an ashtray, mostly full of butts. Caption: ... Those who didn't make the cut. 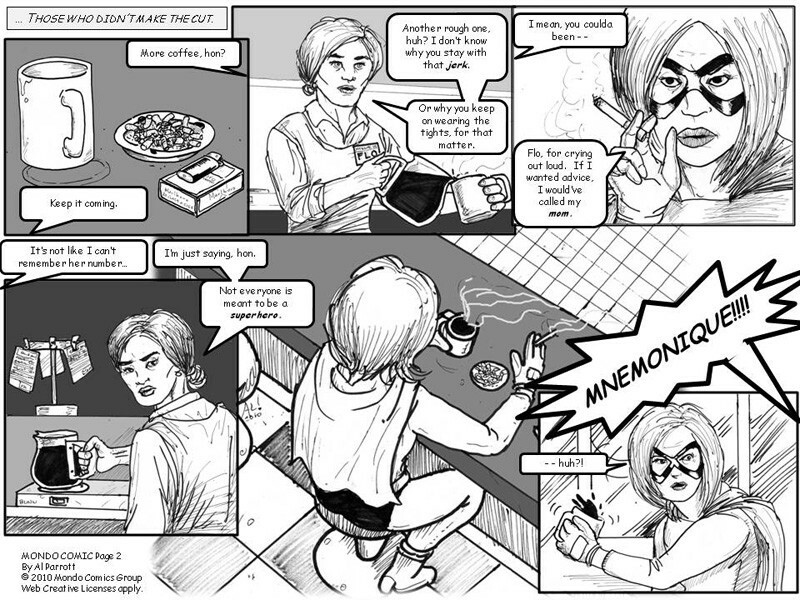 A nondescript waitress with a caring face picks up the cup and fills it while addressing Mnemonique (offpanel). Waitress: Another rough one, huh? I don't know why you stay with that jerk. -/- Or why you keep on wearing the tights, for that matter. On Mnemonique's face as she lights up another ciggie. 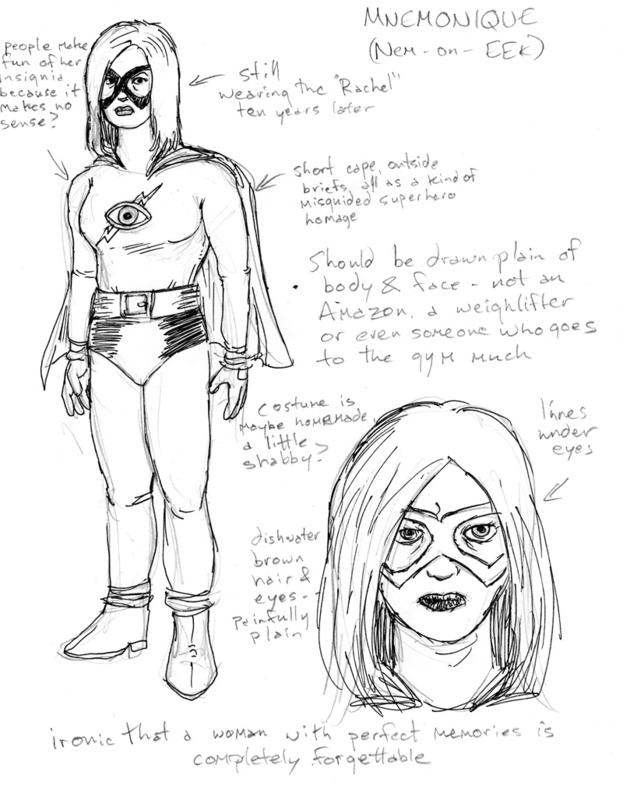 She's a careworn late-twenties woman, not especially gorgeous like 99% of superheroines, wearing a domino mask. Mnemonique: If I wanted advice, Flo... -/- ... I would call my mom. Flo, the waitress, is not totally put off by this - she's probably treated this way often - but she calls to Mnemonique over her shoulder as she goes to put the coffee back on the burner. Flo: Not everyone can be a superhero, hon. Mnem pauses sucking down the cancer stick and stares into the coffee cup for a long, contemplative moment. Someone calls to Mnem from the door and she turns to see who it is, sloshing a little coffee. It was then time to rest on my laurels. Or was it?! That was a pretty happy accident. Edit: Page three of the comic went up, drawn by my good pal Breck of Animal Magnetism. As far as I know this is the only site on the whole internets where you can see all three pages together. Page Four will be by Rob of Love Kills Slowly, and Effigy Power of RPGeneric will return for page 5. This may mean I will be next for page 6 - unless someone else from Mondo jumps onboard.